I started this last night and it's intriguing so far. The opening is mind blowing. Let's start with the end of the world, why don't we? Get it over with and move on to more interesting things..
Wow what a way to start.. I hope the rest is as good. I've not read anything from N.K. 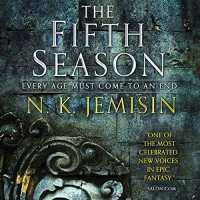 Jemisin but I will be looking out for this author if the story ends as well as it starts.